Willow Spring, NC: Mrs. Omalene Walton Barefoot, age 89, went to her heavenly home with family by her side, Friday, June 1, 2018 at Liberty Commons Nursing and Rehabilitation in Benson. Funeral Service will be 3:00 PM Sunday, June 3, 2018 at Friendship Baptist Church, Angier. Officiating will be Rev. Jerry Peck, Dr. Charles Ennis and Brother Mack Fowler. Burial will follow in the church cemetery. Mrs. Barefoot was born on September 5, 1928 in Johnston County to the late Amos A. and Mary Alice Stephenson Walton. She was preceded in death by her husband, Warren Harding Barefoot and brothers, Maylon Walton and Lavern Walton. 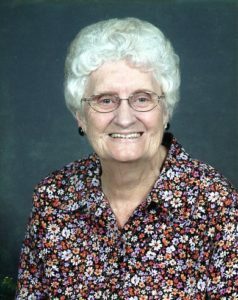 Mrs. Barefoot was a retired seamstress with Champion products and a member of Friendship Baptist Church. Surviving family include children and spouses, Warren Wayne Barefoot and wife Melinda of Clayton, Steve W. Barefoot and wife, Susan of Four Oaks, Tanja B. Carroll and husband, Jeff of Raleigh; grandchildren, Steven Barefoot and wife, Brittany, Brittany Barefoot, Sam Barefoot and Matthew Carroll; sisters, Elizabeth Wedding of Willow Spring, Katherine Pope of Lillington, Charlotte Walton of Willow Spring; brother, Rosyval Walton of Willow Spring; several nieces and nephews. The family will receive friends from 6:00PM to 8:00PM Saturday, June 2, 2018 at Rose & Graham Funeral Home in Benson and other times at the home of Tanja and Jeff Carroll 900 Lendermans Circle, Raleigh, NC 27603. Flowers are welcomed; however, memorials may be made to Alzheimer Eastern NC Chapter, 3739 National Drive, Ste 110, Raleigh, NC 27612 and write on check “Memorial for Omalene Walton Barefoot”.